Objectives: to evaluate three different commercially available single incision laparoscopy access devices for their ease of use. Methods: Four expert laparoscopic surgeons performed laparoscopic cholecystectomy, suturing, small bowel resection, and gastrojejunostomy through a single incision in a porcine model. A cylindrical, a disc shaped, and a sleeve based access device were evaluated for performance. Seven features were scored on a 5-point Likert scale. Results: All procedures were successfully completed. Mean scores for each feature and global score are listed in table1. Tissue dissection and retraction were challenging due to instrument crowding and lack of triangulation. This was partially overcome with the use of flexible tip instruments. The suturing task through the cylindrical device required insertion of an additional 2 mm instrument. Two of the tested devices included trocars in the design, maximum trocar size 12mm vs 15 mm. Quoted cost for the devices varied widely with the sleeve device at the lower and the disc shaped at the higher end. The disc shaped device does not include trocars. 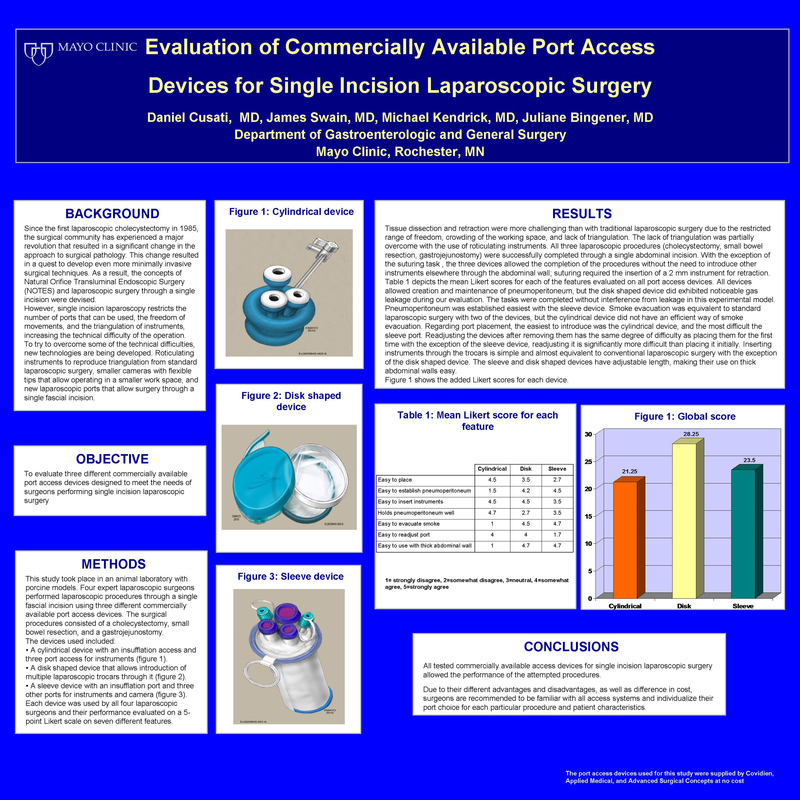 Conclusions: All tested commercially available access devices for single incision laparoscopic surgery allowed the performance of the attempted procedures. Challenges continue to exist and continued improvement in design is necessary.